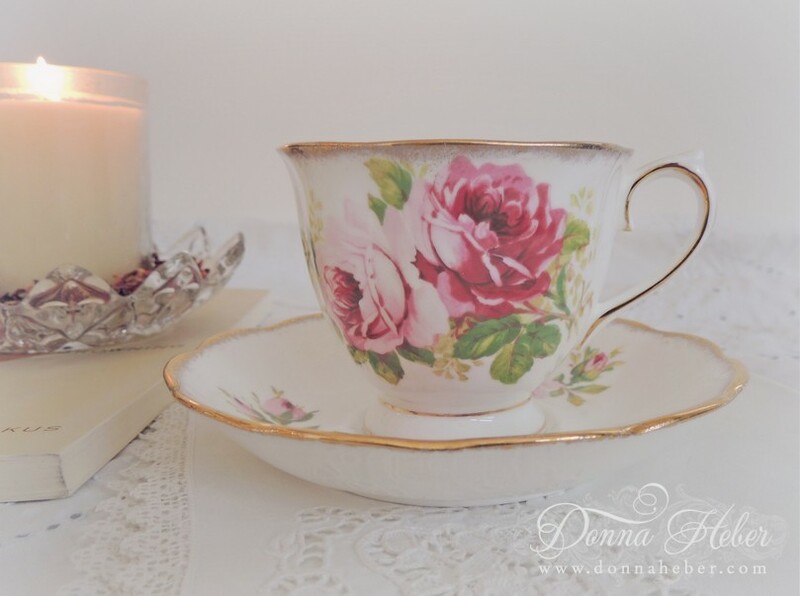 Donna's Designs: How do I love thee? It's time for tea! I thought I would share some poetry with you today. I have always had a fondness for the English poet Elizabeth Barrett Browning. Her famous line, "How do I love thee? 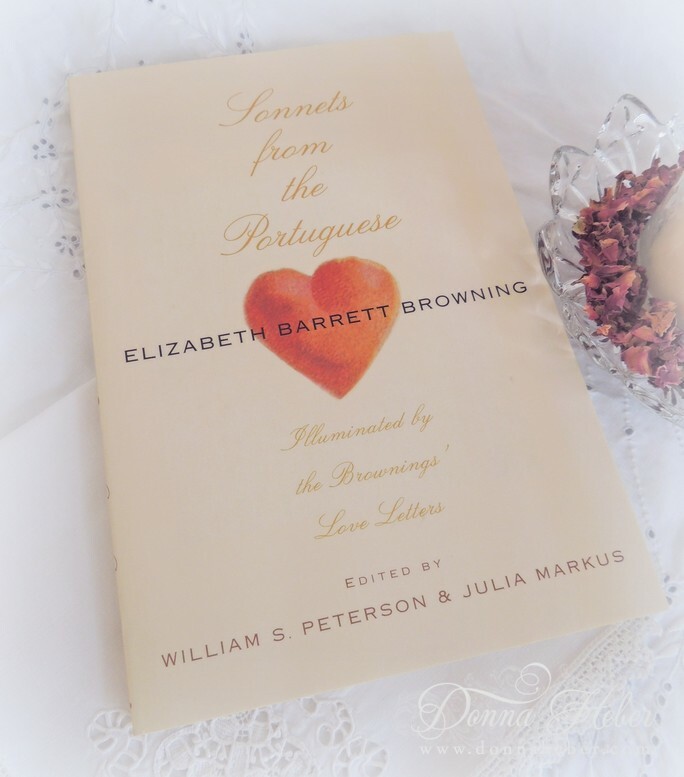 Let me count the ways," from her poetry collection, Sonnets from the Portuguese was first published in 1850. Tea is being served in an American Beauty teacup. Soon I will do a tablescape with my collection. 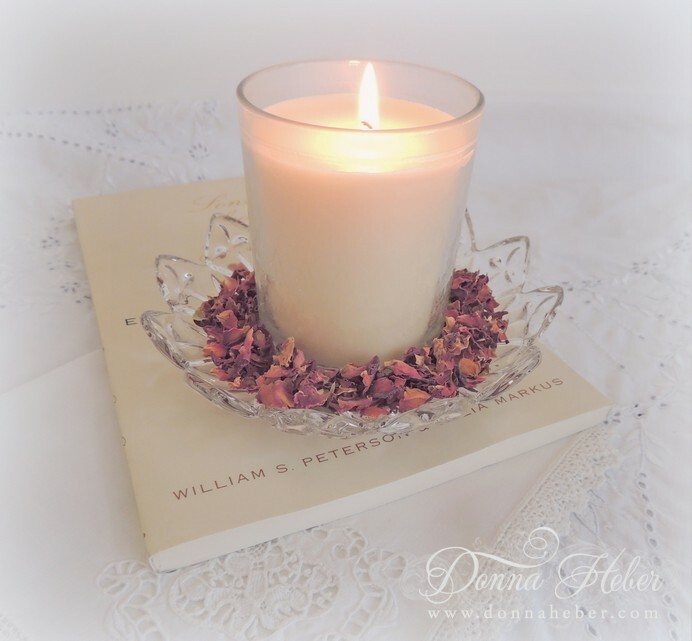 A vintage bowl from the Federal Glass Company makes a perfect candle holder. Pressed glass featuring 12 points. Pattern #2833 ~ designed in 1954. Dried rose petals from the garden ... I collect them all summer long. With Valentine's Day around the corner have you been enjoying any poetry? A Sonnet ~ fourteen lines, each line containing ten syllables. Thank you for having tea with me today. Don't forget to stop back to view my Valentine's Day cards and I will also be announcing on Saturday the winner of my Grow Your Blog giveaway. Beautiful,Donna. Really pretty Tea cup. So inviting. The teacup is so pretty! I enjoy tea too. Lovely tea cup ,there must be lovely poetry in that book. What a lovely tea, Donna. 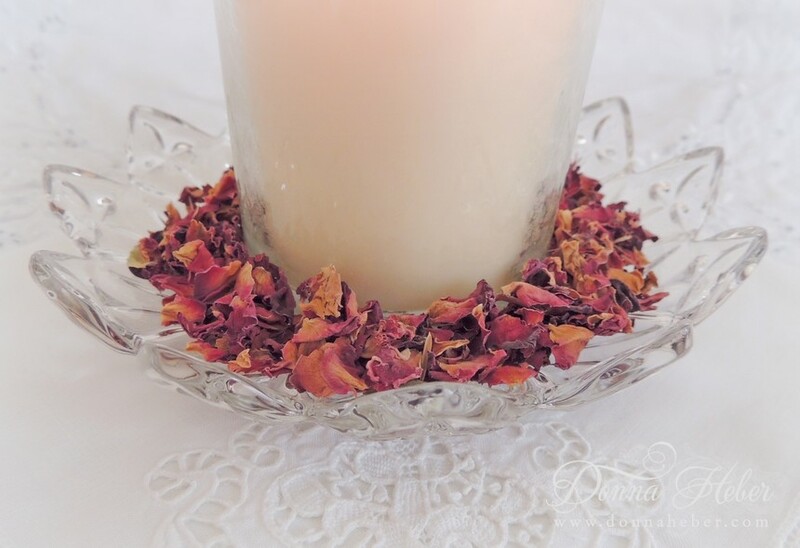 I like your cut glass dish as a candle holder enhanced with your own dried rose petals. Happy Valentine's Day! I love this cup and saucer (I have one too) and see it on other blogs. It is a classic! Yes, I enjoy poetry and I love American Beauty too! Your cut glass makes a sweet dish for holding your rose petals from the summertime. I save all my roses too. Thank you for coming to tea and Happy Valentine's Day! Your teacup is lovely Donna and that has always been one of my favorite poems. Have a Happy Valentines Day. What a beautiful teacup! So perfect for a Valentine tea! I have a dish like your candle holder and I save my rose petals, too! 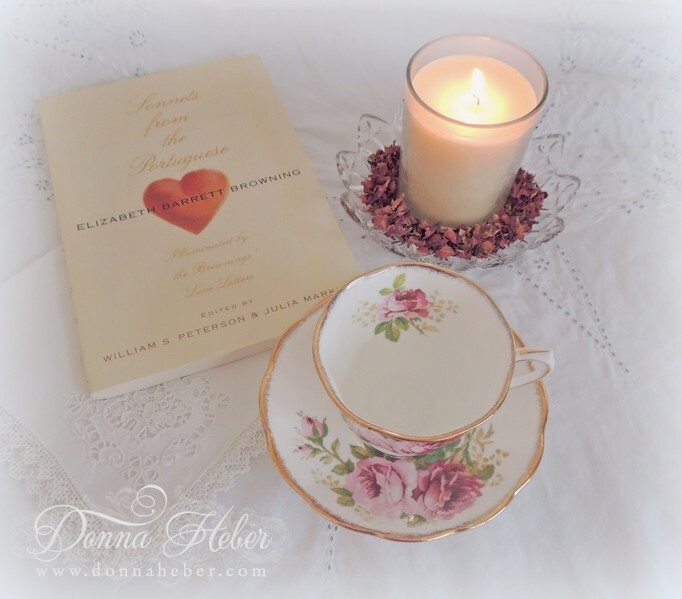 A favorite poem and a lovely teacup! 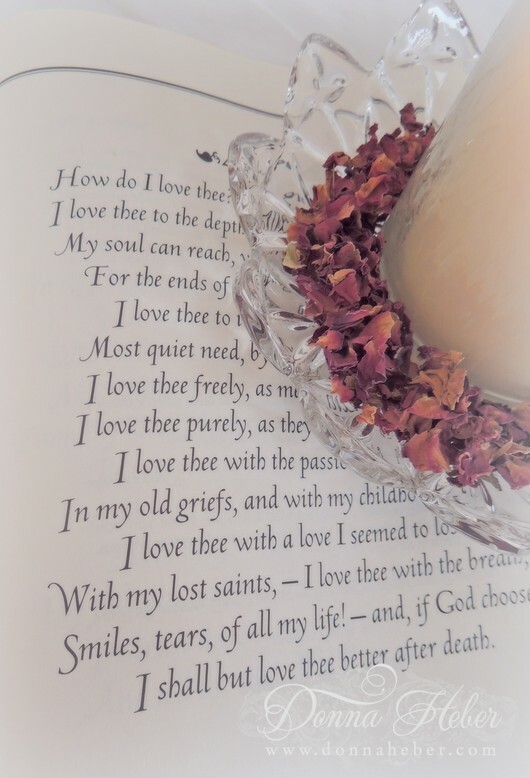 I love the poem "How Do I Love Thee"! I thought you might enjoy the Armstrong Browning Museum at the Baylor University campus in Waco. There is wonderful information on the web site and hope you enjoy it. Your American Beauty cup and saucer is lovely for Valentine's Day! Your teacup is beautiful, Donna. 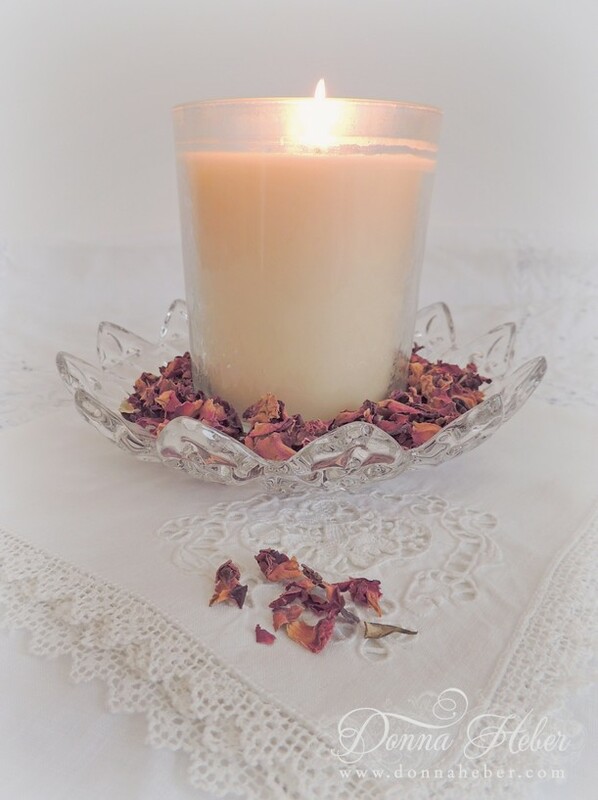 I like your pressed glass and how you set your candle and rose petals in it. It looks lovely. Happy Valentine's Day! Thank you for sharing your tea with us. I cannot wait to come back. The china is just lovely! 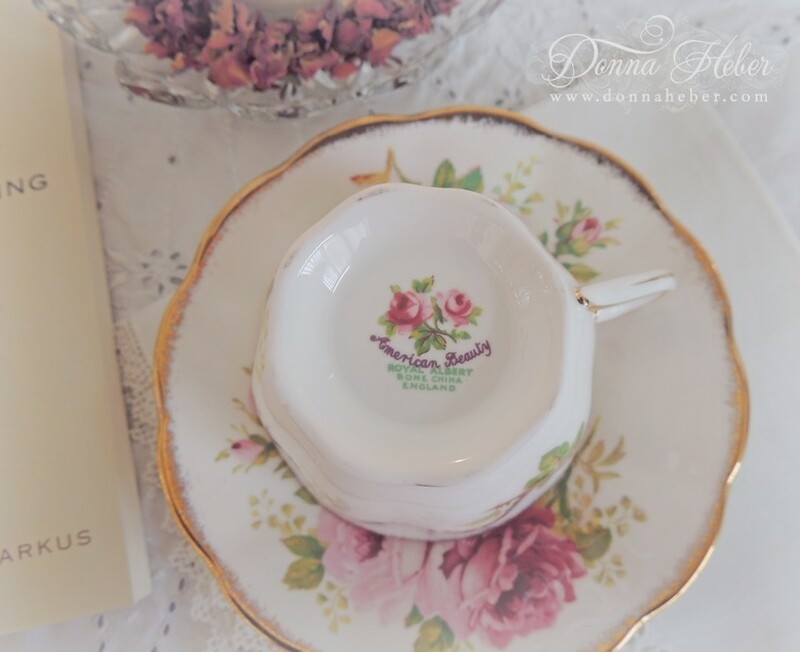 This is beautiful, Donna--I love the teacup set against the pretty lacy linens, and the poet you chose.